Meet Some of Our Meditators – and Volunteers! We're fortunate to have a diverse community of Brooklynites. We've got scientists and researchers, writers and journalists, artists and designers, teachers and parents, and even an aerialist. We welcome kids. 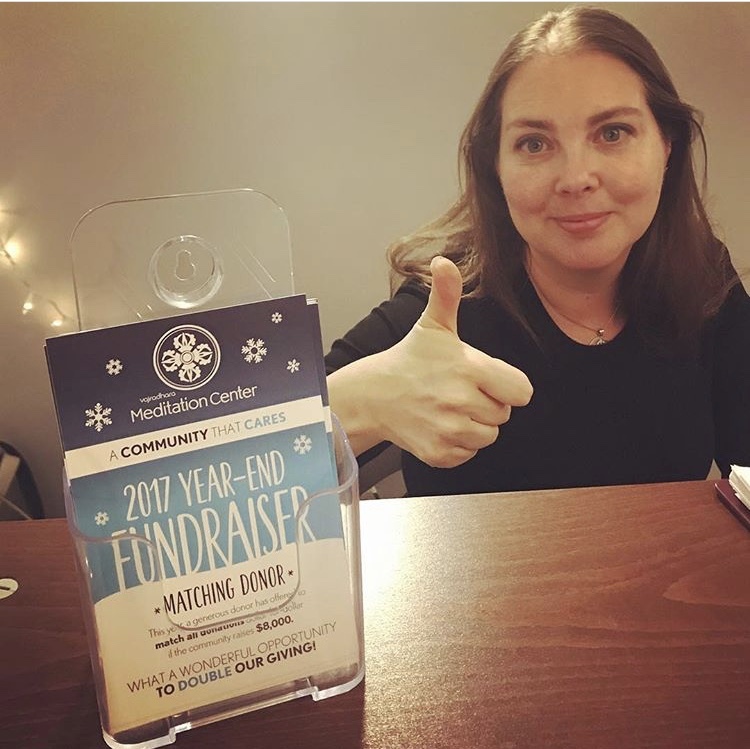 Our community event planners organize potluck dinners and BBQs. There are plenty of edible goodies and good conversation to enjoy before and after classes. Check back often to see what event we've got planned next and come join us to get to know your fellow meditators! I have been meditating on and off for around a year, though finally found the determination for daily meditation a few months back. Why do you meditate? What is meditation bringing to you? I practice meditation to calm and control my mind, as well as, clarify my understanding of this reality and how I may begin to change the cyclical nature of suffering I find myself in. What is your favorite meditation? I like to begin with meditating on the breath to calm my mind, then move to meditation on the mind and the clarity of the mind, and then finish with meditating on taking the suffering of others. 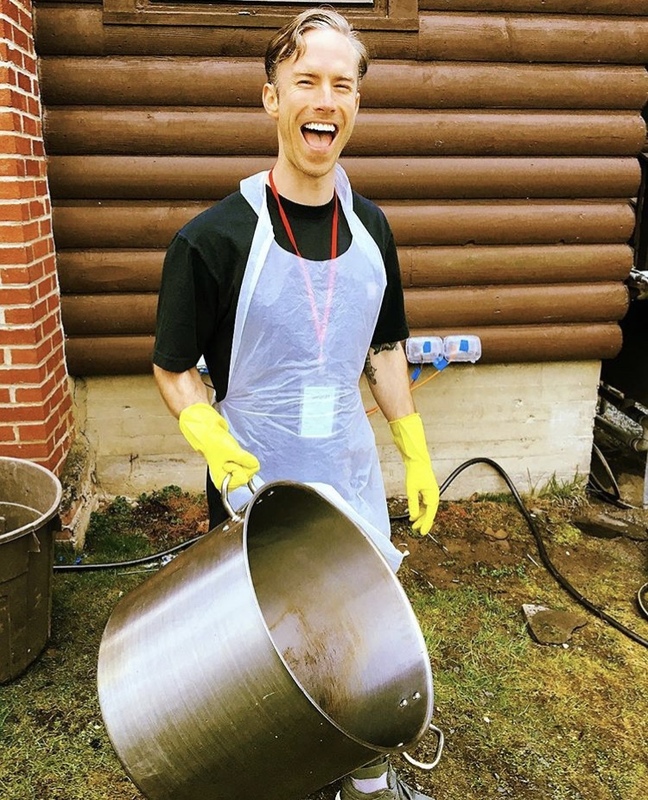 This is Will at the 2018 US Festival in Glen Spey, NY cheerfully taking on our center’s volunteer assignment – pot washing! I’ve been meditating about ten years, but I didn’t get serious until I joined Vajradhara Meditaiton Center four years ago. It’s hard to maintain a practice on your own. You can literally forget why you’re doing it. Meditation gives me freedom. I used to react without thinking to just about everything that happened. I felt like a slave to my worst impulses. Now I have a choice about what thoughts I want to entertain and how I respond to what’s happening. It's very relaxing and saves me a lot of trouble. Clarity of mind meditation, which has you meditate on the nature of the mind itself. I’m starting to understand that my true self simply appreciates and enjoys everyone and everything that happens—it has no worries and no preferences. It’s super fun and freeing to identify with that aspect of my nature. I’ve attempted meditation several times but never developed a practice until I came to the center. I’ve been diligently practicing for a over a year. I started meditation to get through a difficult life change and wanted to find some clarity; since then it has helped me tremendously with my anxiety and insomnia. I’ve been able to find more peace of mind and how to deal with difficult situations. I have two, I enjoy the clarity of mind and meditating on death - a reminder that life is precious and we need to make the most out of being happy. I started coming to class at the Center almost 5 years ago! But I didn't start meditating outside of class for a while. Then I attended a day-course in meditation that gave me practical tips and I learned that you have to meditate on your own and try, at least every day, if you want to make any spiritual progress. So I've been steady ever since. I meditate because really, let's be honest, there's nothing better for you and for all the people you encounter. My favorite meditation is black and white breathing. You can do it any time, anywhere and all day long! Simply imagine that when you're exhaling, all your problems, anxieties, negative feelings and thoughts exit your body like a cloud of black smoke that disappears. Do that for a little while. Then imagine that when you inhale, a clear, pure light of bliss and wisdom in entering your nostrils and filling your body. It's better than a Caribbean vacation. I've been "meditating" on and off since I was fifteen, but I've been coming to the center for about a year and a half. To be honest, my meditation practice is still patchy, but even that has made a huge difference. Meditation is like taking your own good advice. It helps keep me more grounded and gives me a little extra room to find the ease in my life. The best side effect is definitely the increasing sense of compassion and community. Clarity of Mind. It's so breezy in there!